Great for getting toast out of the toaster! This is an easy, safe and convenient way to remove toast from the toaster. I'm very happy with this item,now I don't burn my fingers, when I take the toast or bagels from the toaster. I have wanted one for a long time, finally you have it a great prices. Saves my fingers when removing items from our toaster. I bake my own bread and it often is not as tall as store bought bread. When it is toasted, it doesn't reach to the top of the toaster so I can get it out safely and without tearing it. Safer than using a knife!! I used to use a knife to pull out my toast, which isn't the safest idea(although I did pull the plug). Now with the bamboo tongs, I don't have to worry if my toast gets stuck in the toaster. Good idea to keep them around. These help get so many things from the toaster. You won't burn you fingers on bagels. You can grab the things that don't stick out of the top when they pop up. Every house should have one! No more burned fingers. I bought these for taking small muffins out of the toaster. The muffins are small making it difficult to grab without getting your fingers burned. The toast tongs are especially nice if you are making a lot of toast, muffins, or bagels at one time. They're safe, too, because they are not metal. Should have bought these a long time ago. Keeps my fingers from getting burnt when getting the smaller breads out of the toaster. I already had some wooden tongs. When one of my Granddaughters was at my house, the toast got stuck in the toaster. She went to the silverware drawer to get a fork or knife!! I "freaked"!! I bought 'several' For EVERYONE in my family - Thank-You!! These are really great. Fits in toaster nicely to pull out anything!!! Love it! Great for getting anything small out of the toaster. Bought it for part of gift package of small kitchen utensils. My Step-Daughter was thrilled to recieve these. I had a pair and order these to give to her after I noticed her removing stuck toast with a knife. These tongs are great to use. Perfect size. No more burnt fingers.! I LIKE THE BAMBOO TONGS BECAUSE THEY ARE EASY TO USE AND I STOP BURNING MY FINGER TIPS. The tongs are an absolute wonder when it comes to toasting muffins or any type of bread. Especially like them when I am having cinnamon/raisin muffin which get extremely hot and are too small to get out of the toaster easily. Rather, they used to be hard to extract. Now with the wooden tongs it is a snap. Never be without them again as we use our toaster daily. I love this item. Before I got this I was using a fork, knife or even my fingers (ouch!) to get my toast out of the toaster. With these tongs I can grab my toast right out and never have to worry about burning my fingers. love,love it, my don`t get burn anymore trying to reach for the toast from the toaster,very handy. So good I bought 5 more for friends! I was delighted to find these tongs. Anyone who has a toaster should have them. They work better than anything else I have ever used to get something out of the toaster that is too small to stick up where you can grab it without burning your fingers. You don't even have to unplug the toaster because they are non-conductive.This product that does exactly what you want it to do perfectly! I like the tongs so much I bought five more to give to friends.Great stocking stuffer. Glad I purchased these tongs. Saves you from burning your fingers trying to remove toast that is hard to get out. Best saving product you can buy. No more burnt fingers! I bought two, one for home and one for motor home. A simple and inexpensive device that requires no maintenance and is effective in snatching toast, muffins, bagels out of the toaster without burning fingers. I was tired of burning my fingers on the hot toaster trying to get the toast out when toasting smaller bread. These are great for smaller breads such as bagels and sandwich thins that are down deeper in a toaster than a regular piece of bread. They are also good for counter top toaster and convection ovens to grasp things. I got tired of toasted fingers so when I saw these, I ordered two, and have enjoyed using them. You always manage to come up with household products that you cannot find any place else. I PURCHASED THE BAMBOO TOAST TONG'S FOR A FRIEND THAT IS BLIND. IT WAS VERY HARD FOR HIM TO BE ABLE TO GET HIS TOAST OUT OF A HOT TOASTER WITHOUT BURNING HIS FINGERS. I SAW THESE AND THOUGHT THAT IT WOULD BE PERFECT FOR HIM. IN FACT THEY WORKED SO WELL THAT AFTER HE HAD A FIRE IN HIS HOME AND HIS FIRST PAIR WERE DISTROYED, I GOT HIM ANOTHER PAIR. When you are using a toaster and your bread gets stuck, this is a safe way to remove it and keep you from potential shock hazard by sticking a knife in the bread to get it out. I bought one for my friends household, my daughters household and myself. I use them to get my english muffins out of the toaster as when they popup not to much is exposed and I feel a lot sfer using these tongs over a fork. This terrific little toast grabber is so simple and SO HANDY! And even though I always unplug the toaster first, I feel much safer using a WOODEN (rather than metal) utensil to liberate my English muffins from the electrical mechanism. Every kitchen needs one of these! I love this product!!! Have bought several from different catalogs. Have given as gifts. Don't use for greasy or other foods that the tongs need washed. Repeated washing makes the glue weak and they separate. My husband did that to one pair and reglued it back together. Lesson learned. Don't think they're made for greasy foods, anyway. "Toast tongs", or else they'd stay together (??). Great for lifting fresh toast from the toaster. Good for lightweight small hot objects. We used these growing up and was thrilled to see that they are still being sold. I really like this because it's safer than a knife or anything other. Can still hold it while trying butter any shape form of "toaster" Thank You Walter Drake..your the B E S T ! I LOVE ALL THE PRODUCTS I PURCHASED. These should have been invented a long time ago!I can't tell ya how many times I've burned my fingers trying to get toast & buns out of my toaster. Comes in handy for my toaster oven, too! Perfect size to remove item from toaster. Spare fingers. Really liked this product. every kitchen needs one of these I love it keep your hand from getting burn. I use this item for preparing breakfast. Helps me quickly retreive my toast from my toaster oven. Its great because it small and compact easy to use because I have small hands. Can find not a thing wrong with this item. So simple. Easy to use. Set up a hook by toaster to hang it on so it was always available. No more burned finger tips! This is such a handy dandy little tool. It handles anything that is being toasted in the toaster. And it is SO easy to clean after each use. Great gift idea for a new bride or Christmas. I bought one for myself last year then 4 more for gifts this year. I make my own bread and it usually drops down into the toaster. These tongs work wonderfully and I wouldn't want to be without it. I leave it on top of the toaster when it's not in use so it will be handy. Saves your fingers getting hot toast from the toaster. This lovely tong is one of my favorites, so much so that I bought several more to use on my buffet table for serving pickles, olives, crudite and I've given one to my sisters and friends (to keep them from swiping mine). They love it too! Great safe way to use the toaster. Great safe way for my 5 year old grandson to help in the kitchen. Toast is his thing now. Have used on several products. Small pieces of toast, bagels, etc. I just got my toast tongs and love them. I bought them to replace the ones that I had that broke. A very simple, practical, little pretty thing. the toast on the plate without burning my fingers. LIKE THIS PRODUCT VERY MUCH!! I have trouble with my hands, this helps a lot in the kitchen. Was excited to find these. I had been looking for one of these for some time and everytime I burned my fingers getting the toast out of the toaster I reminded myself to keep looking for a small set. I use this everytime I use the toaster! I even bough some for my kids too! When you offered this I jumped at it - and bought 7 of them to give to friends! What a deal! Everyone is pleased! Best contraption for getting that toast out. Everyone should have one. Now I don't hear my husband saying those naughty words every time he can't get the toast out & ended up burning his fingers. Don't let that toaster get the better of you, get one of these. Really cheap too. 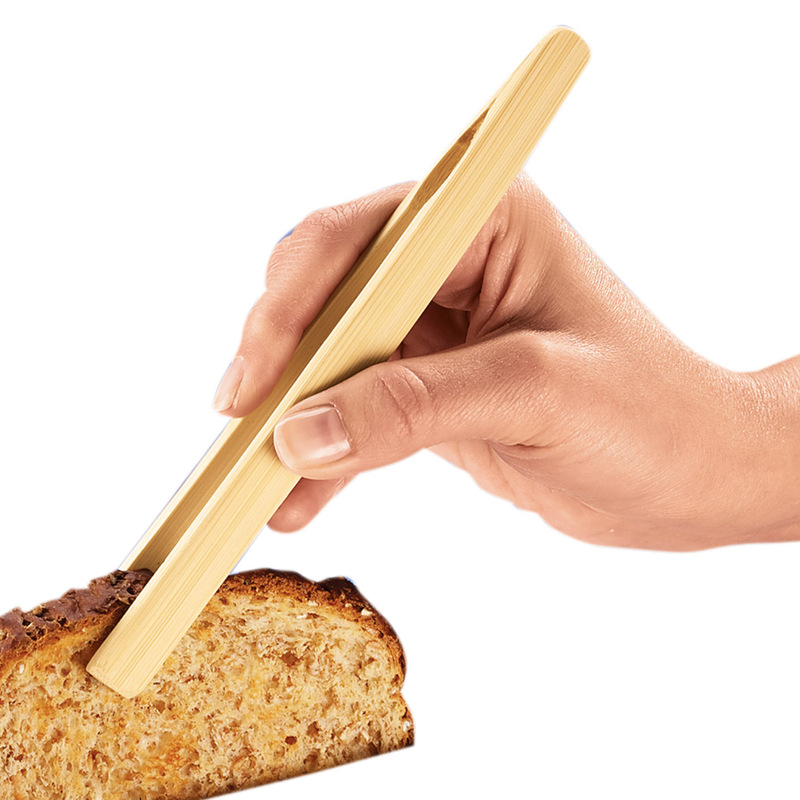 I like this little bamboo tongs for taking toast from the pop up toaster. I think it could be a bit longer for getting things out of my massive toaster oven though. No more burned fingers or possible electric shock when removing items from toaster. For such a simple concept, this works great. No more burned fingertips taking toast, english muffins and bagels out of the toaster. These are great for getting toast out of toaster! This product has saved my fingers from hot toaster tops while trying to remove toast,bagels and poptarts. The wood material takes away the worry of using a metal utensil in an appliance that is plugged into an electrical outlet. Great for removing hot toast and bagels from toaster. No burned fingers. I am a big fan of toast and this is the ideal gadget to save singed fingers; I'll never drop another piece of hot toast! No more burned fingers from trying to remove steaming hot toast from the toaster or toaster oven! 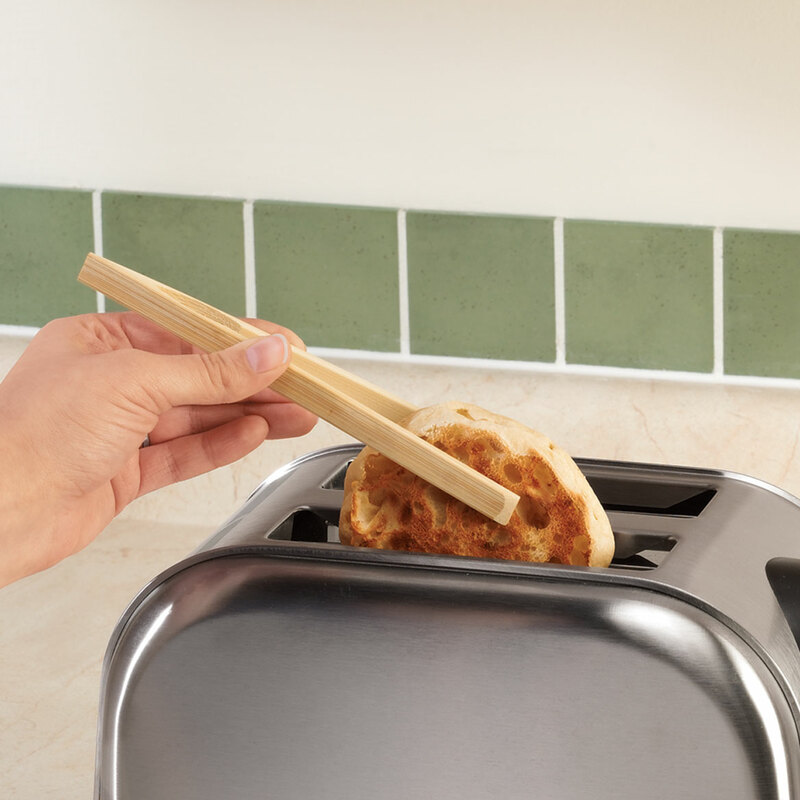 These handy and sturdy toaster tongs protect your fingers and keep you safe at the same time. What a great find! This is great because you can use them to get stuck pieces of toast or even bagels from the toaster. It is even better than using a knife or fork or some utensil to get down into the toaster to get that pesky piece of toast out...otherwise you will get shocked. These tongs are great for that. I have been searching for this for a very long time. I was thrilled to finally find it. I bought 2 and am glad I did. Use almost every day. Wood tong is simplicity itself, but definitely keeps your fingers frorm getting burnt. I use mine every day. So useful,everyone should have them. Taking toast out of the toaster. Love my toast tongs, no more burned fingers when retrieving English muffins and bagels, as well as toast! Also a great "go with gift" when I gave a toaster as a gift! No more burned fingers getting toast. Best idea I've seen in a long time. Keeps from burning your fingers to get toast or other items from a toaster oven. Love it. Keeps fingers from burning or reaching down in toaster if bread does not come to the top. Nice little item to have! I have burned myself or used inappropriate tools and the toast tong is really quick and convenient and much safer. Simple to use and does exactly what it's designed for. Much easier and safer than fishing around in the toaster with a metal fork or knife. I would definitely repeat this purchase and replace if needed. This simple yet very effective tong has been an unexpected surprise! I never thought that it would be the perfect size to grasp not only toast, muffins and bagels, but also other small items that I cook both on top of the stove or in an oven. It's a great find and I love it. I love this product I purchased several for family. Works great. No more toasted hands. I've used them and they are great! No complaints. Perfect size and I don't burn my fingers. My husband would put a fork into the toaster to remove the stuck toast. I bought this for him and he loves it. I told him a fork is not a good example for our children to see. When he uses this product he raves about it all the time. Do you love someone with diabetes,arthritis, or neuropathy? Anyone with loss of sensation is in constant danger of burning himself, and these little tongs work wonders. I couldn't live without them and can eat bagels with raisins again. There is nothing worse than a thumb/raisin burn! A perfect stocking stuffer. The first time I used the toaster tongs I was amazed, no more burnt fingers, no putting utensils in the toaster. I bought one for each of my grown children, they also love them. These tongs are used constantly at our house! A very good purchase! It would be even better if there were a longer version. Longer would improve use in toaster ovens, regular ovens, use in serving such as at a buffet type event, retrieving items in a deep container, etc. Maybe in 9, 12, or even 15 inch. We would use all those sizes! If you are wavering, you will be happy you bought these tongs! The "toast tong" is easy to use and to store near the toaster. It is the proper size to go into the toaster and grab whatever will not come out. I recommend that every kitchen should have this product. Works great for removing Waffles or Toaster Strudels from a hot toaster. I bought this for my mother and it makes life alot easier for her! I was always getting my fingers burnt when I tried to get my toast out of the toaster. These are so simple and easy to use and clean. I use this for anything I put into the toaster. No more burned fingers getting out the poptart, toast or frozen waffles. Bamboo Tongs are hand savers . Bamboo Tongs are suppose to be call Toast Tongs . I was used to burn my hands all the time but these tongs saved it now . I keep them by the toaster & my family use it too . They are very convenient not bulky . It is just perfect . I use my toaster oven a lot, and they are great for removing things when they are done - no more burned fingers. I would certainly recommend them to a friend. A simple thing, but so fantastic. I had purchased a pair of toast tongs at a "craft fair"...quite expensive. You have managed to made them so affordable. I use them for toast of course, but also to remove the tea bags from the tea pot. I've used them to pick bits of egg shells from a to "aggressively cracked" egg. To many uses to list. I bought several for stocking stuffers for my "cook" friends and family. Thank you Miles Kimble. I bought them for my 88 yo mom and she loves them. To get toaster strudle out of the toster as well as other toasted things. How great it is not to burn our fingers when getting toast from the toaster! Thanks for offering such a great product! Not since the wheel or the printing press has a device so impacted western civilization. I can't even begin to predict the impact on the world economy, peace or the middle-east. Everyone should have one. Two (says Bill who if possible is even more stoked)! you have tried them you will be convinced!!! WE LOVE THESE TONGS ! I also use it to remove garlic bread, toasted buns, etc. from the toaster oven. easy to use product and very needed! I bought out most of what they had in these tongs as this is the best way not to get electricuted by your toaster or hot fingers. does not make extra crumbs and does not slip out of tong. Gving as a stocking stuffer to everyone and as package topper. gong to order more for luncheon aat church wrap and make them guess. Love this product. Such a simple solution, just keep it right by the toaster, and don't worry about burnt fingers anymore! It helps in handling hot items without burning fingers! I love it as I was burning my fingers trying to grab the small bagels out of the toaster. It is so handy and so easy to store too and can be used to grab other items as well. I am so glad I sent for these handy tongs. Thin bagles and mini bagles can be removed from the toaster without buning my finger tips. These are difficult to find! Very unique and useful. Can be used for other purposes in the kitchen. I like the tonges, they make it a lot easer than burning my fingers. Safe way to remove food. No touching food and safe with electric appliances. I bought these to keep my husband from buying another toaster (that we really didn't need). He is impatient and has a hard time getting bread out of the slot (especially the new round breads) and would have to unplug the toaster and get a fork or knife to get the bread out. These have totally changed that--he loves them and says they work very well! We leave them hanging over the middle of the toaster slots once it has cooled. I have even bought another pair for friends for Xmas! SOMETHING SO SIMPLE ... AND, IT WORKS. Handy for things like bagels-- to get out of the toaster. Always have mine on the ready. I always complain when the bread gets caught in the toaster. My husband puts rolls in there. But such a simple item makes it easy to remove any bread or waffle from the toaster. I also bought 2 more for a friend and my daughter. They could not believe something so simple would work. It does and it's amazing. No more forks no more taking the plug out. Just a little wood tong. These bamboo tongs are super for extracting stubborn toast/baggels/etc. Sometimes they don't fully pop. Reaching down into the toaster with the tongs is no problem. They also save fingers from the hot toaster and hot toast too. I use them to lightly press down on the toast when buttering while still very hot. I like them so much, I bought these for all my children and a few other friends that have remarked how useful they were. My grand children were visiting & these thongs made it easier for me to feel safe in letting them help with fixing meals. I hate to use gloves, and sometimes paper towels to move hot food around. The tongs give me a way to move food, as fried foods to and from the pan. Also salads tossed and served. Safe way to remove toast, without having to unplug the toaster and reach in with a metal tool. I foresee using this often, maybe even every day. My husband said this is the best purchase I've ever made! He loves using when he toasts his English muffin in the morning. I use these tongs for toaster items, serving hors d'oeuvres and transferring items from oven to platters. These tongs are great to extract toast from the toaster, retrieve teabags from hot tea, squeeze out the teabag to get full flavor of tea. You have to have these. I lost mine in a move after years and have been burning my fingers. I don't know how people take toast out without these??? A visiting friend from the U.K. used our toaster tongs,liked it very much and this one will be sent to her. toast, bagels, english muffins, pop-tarts etc. I use mine all the time. With my fat fingers I get burned if I don't use it. Bamboo Toast Tongs are GREAT and SAFE! I always keep this item handy in the kitchen. These Tongs provide an easy and Safe way to remove hot toast or pastry from the toaster. You do NOT want to use your fingers (messy or burns) or worse - an electrically-conductive metal fork or other item for this purpose (shock/electrocution). Great idea. Wish I had bought it sooner. Great to remove hot items from toaster & oven trays. These work very well in the toaster. I feel that they are much safer than the metal tongs I had been using. Also have tried them in my glass cookware and they work fine. Use for pickles, olives too. Where have these tongs been? I was so tired for unplugging the toaster to use the tip of a knife to remove pop tarts, muffins, etc. Now I just grab the easy-to-use tongs to remove anything without unplugging my toaster. New thought: use for olives, pickles, et al. (while in jar or on the table). I can't find anything that is not great about these Bamboo Tongs. How great is this little gadget? It is compact enough that it can be stored in the divided section of the silverware tray, it is made of Bamboo so there is no risk of shock when used to take your toast out of the toaster, and it will reach down in to extract English muffins and bagles without tearing them. Love it. love this product, would buy again! No more burning my fingers trying to get the toast or pop tarts out of my toaster oven. Now that we have the grabber we can't imagine how we lived without it. My husband used to burn his fingers every, and I mean every, morning getting the bread out of the toaster. That doesn't happen any more since I purchased this amazing tool for him. Wish I purchased it sooner. This sure beats trying to remove small pieces of toast with a knife or fork and having to worry about getting a shock or unplugging the toaster.This is the perfect solution! Thank you for carrying this item! Great for the toaster, don't burn fingers any more. It's a handy item to have to safely remove food from toasters and toaster ovens. You can also use it to move food around in non-stick frying pans. Since discovering this tool, I have purchased them for a number of family members. they are great for sticking in toaster when anything is stuck and you wont get a shock they are great all around. We use the tongs for getting out toast and bagels. Tired of burning fingers every Time I made toast . This was great idea. Love the toast tongs. What a great idea. This was the only place I could find them. Thanks Miles Kimball! These are such a help saving burned fingers. We use ours for toast and English muffins. No more fumbling with hot breads. I don't have to fight to get my bread out of the toaster anymore. USE WHENEVER I TOAST :BREAD, BAGEL, WHATEVER YOU TOAST! Its. Lightweight and easy to manipulate. Its a convenient little tool. I'm thankful for it because I now avoid burning my fingers taking toast out of the toaster. It makes a nice gift too and the price is right! I found it hard to find something to pull out toast after my original plastic one broke. This product will be very handy. I love these for getting my toast out, turning little things over in my oven and saving my fingers from getting burned!!!! Very handy item for getting toasted bread, bagels, etc., out of toaster safely without burning fingers or risking shock from using metal implements to remove toast. LOVE THESE BAMBOO TOAST TONGS! BOUGHT MY KIDS ONE ALSO! great for removing any bread safely! Safe for any person to use including kids. A must have for anyone who uses a toaster!! Really!!! I use these tongs every day to take toast and muffins from my toaster. How anyone could live without this is a mystery. I think they should come with every toaster. No longer does my husband hear me say ouch ....oooch... or other unmentionable phrases when making breakfast. These are a finger saver. So simple yet so ingenious. These tongs are so easy to use and such a wonderful idea that I am shocked I haven't bought them before now. The price is right, the design is flawless and it serves the function of keeping an old lady in a wheelchair from burning her fingers or electrocuting herself trying to get a piece of toast. Easy to use to pull toast or muffins out of the toaster or toaster oven. Nice length. This is great for getting hot items from toaster. My mother has one and said she has had it for many years and did not know where she had gotten it, so I was excited to find it here. Sitting on side of Kitchen cookware container - easily grabbed to get toast, bagels, muffins, etc. out of Toaster without getting shocked electrically. Fabulous. Used daily to extract those tricky bagels and English muffins from the toaster without burning fingers. A Must for the Kitchen! No more burning the tips of your fingers on your toast! Grab the tongs and remove your toast or bagel! Easy as that! Everyone should have these in your kitchen! These were great. I used to burn my fingertips all the time getting out toast. These are great and I no longer have to grab out of the toaster and throw the toast as I burn my fingers. I love this product ~ No more 'burn' fingers ~ love it. works just like I need it to. Great for getting your toast/bagels. Can be used to grap vegetables off a veggie tray. What did I ever do without this item? Use it all the time and no worry about getting schocked. It is for toast so you won't get burned. It is perfect size and material for this product. This is the best thing that I've found to get crumpets or English muffins or toaster strudels out of the toaster without burning your fingers. Love these tongs, we use homemade bread that is smaller and is hard to reach in the toaster. Tongs have solve our problem. Toast Lovers - Never burn your fingers again!! keep next to your toaster, use with your toaster oven. Buying one of these should be a mandatory part of buying a toaster. Great product! No more burned fingers -- or dropped toast. My toaster doesn't always bring the toast up to the top of the slot, so the tongs are the perfect "retrievers". You know those waffles, pop tarts, pcs of toast that are hard to pull out when they're done in the toaster? Well, this little gadget is the best thing ever to save your fingers from getting burned! I use them all the time. They're easy to store...don't take up much room & easy to clean. Just love them!! While I use this mainly for getting items out of my toaster(which keeps me safe as I am always in a hurry), I do use it for other items, I grabbed poached eggs to make Egg McMuffins and use it to pick small items out of dishes that I don't want in there. Toast Tongs save our fingers! Now our toast doesn't have to get cold before we butter it! I ordered these for stocking stuffers because it sounded cute but I was not sure they would actually be that great. I bought three: one for ourselves, one for our son and one for my parents. We all LOVE them and use them every time we toast. No more burned fingers or jamming metals things in the toaster. I am not sure how LONG they will last but we are enjoying them until then! No more burnt fingers! I love it! I have a small magnet with a handle that the tong fits onto nicely -- I keep it on the stove hood for quick grabs! To take short toast out of toaster. Great idea to avoid burning fingers on toaster! Utensil wonderful for pulling hot toast out of toaster. Also, wanted to give one to neighbor, but she could never use it. Due to nerve problem, she has no strength in hands to press, squeeze etc. Sad! This would have been a great tool for her to use. This lady is also blind - can't see to pick up her toaster to dump toast out on counter either, but that's how she does it. Then she has a mess. Any new ideas to expand usage for this item? I love this product. I no longer have to burn my hands trying to get the toast out of the toaster. If kept within easy acsess they are very helpful. I just wipe clean and keep in kitchen tool carrousel next to the toaster for use over and over again. I bought these tongs after I caught my husband sticking a dinner knife in the toaster to retrieve his toast. I keep the tongs beside the toaster and no longer worry about him electrocuting himself before breakfast. This is the second time I've ordered these. I got two for myself this time because the last one I had broke and they are very inexpensive. I'm hoping these last longer because they are so convenient and save burning your fingers getting toast out of the toaster. I have given several as gifts with my homemade bread and they were well received. I had one of these before and after years of use, one end chipped off. It was still usable, but I wanted a new one. It sits right above my toaster for easy access. I get a lot of comments, especially; "Where did you get this?" I would most likely buy this item again. I got 2 of these and I am very pleased. No more burnt fingertips from getting hot toast out of the toaster, and they also work nicely for turning tortillas on a hot grill - no more burnt finger tips there either. I would buy The toast tongs again. I purchased a well know maker toaster for the house. It works perfectly but was missing one thing. It never raised the slices of toast high enough and I was constantly burning the tips of my fingers. With these toaster tongs that problem no longer exists. Shouldn't have waited so long to order this. No more burned fingers getting toast and etc. out of toaster.